Are you tired of shuffling through reams of loose paper and scribbled notes? Do you just make up names and statistics for NPCs off the top of your head? Are your players getting tired of meeting the same characters in every adventure? Well, no more! 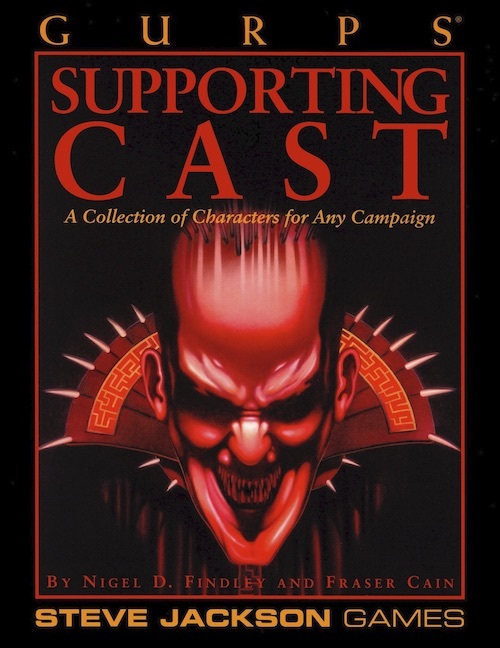 GURPS Supporting Cast is the definitive collection of non-player characters for any roleplaying campaign. Inside are 120 fully developed NPCs, ready to drop into any setting, time or world. From gladiator to gang leader, slave trader to street samurai, you'll find any character you need in this book. Advantages, disadvantages, quirks, skills, and all the other relevant GURPS statistics. A detailed character story, with history, motivations, eccentricities, and secret desires. Conversions to other settings, so you can take your fantasy assassin and drop him into your deep space campaign – or take your contemporary hacker and place him in a world of high fantasy. Adventure seeds! With at least two scenarios for every character, you'll never be stuck for an adventure idea again. 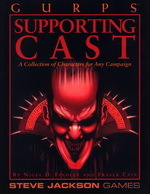 From traditional city guardsmen and shopkeepers to the strange and exotic – demons, dragons, and computer AIs – GURPS Supporting Cast has everything you need to run an exciting, diverse campaign. GURPS Villains – A compilation of dastardly foes from all ages, genres, and backgrounds. Crackpot spy-movie masterminds, backstabbing patricians, grim undead overlords, hard-bitten crime bosses . . . they're all here! GURPS Supporting Cast: Age of Sail Pirate Crew – Take your GURPS Fourth Edition campaign onto the seven seas!